Meatpacking trucks in the shadows of the new Google Chicago headquarters on West Fulton Market. Chicago’s West Loop used to be called Skid Row — a dark stretch of emptiness and foreboding industrial buildings. Then in 1990, a local talk show host moved her Harpo Studios into a former cold storage warehouse on west Washington Street. Call it the Oprah Effect. The neighborhood underwent a massive transformation that hasn’t really slowed down since. Oprah Winfrey is long gone. But blocks away another new occupant in a former cold storage warehouse is now the one making waves. “If you think of uber relative to what — so now it’s not residential, it’s uber relative to the kind of commercial space or the kind of manufacturing that was there,” said Janet Smith, a professor at the University of Illinois at Chicago who compiled the gentrification index. Smith says while people aren’t really being displaced, the same can’t be said for businesses. “And now you’re finding art galleries, you’re finding bougie restaurants. So what’s replacing it is both a different clientele and different land use and probably contributing differently to the tax base,” Smith said. A flood of new techworkers is expected to fuel even more exclusive retail in the area. Already this year the Soho House opened a private club with a rooftop pool. It joined swanky cocktail venues and other seen-and-be-seen hotspots on Randolph and Fulton. On a recent Friday evening before the sun set, customers crowded Green Street Smoked Meats. As a line of people stretched near the door, the inside sounded more like a nightclub than a rib joint. Even during the economic downturn, this corridor proved to be recession proof with celebrity chefs setting up shop along restaurant row. “If private sector decisions move the community to where we might have more higher-end retailers, where we might have higher-end restaurants, then let it be,” said Roger Romanelli, executive director of the Randolph Fulton Market Association, a nonprofit economic and community development group. It’s not just the private sector. Investment has been deliberate here. Two decades ago the city created a tax increment financing, or TIF, district to spur economic development. The city has also given a slew of incentives to the tech industry, and the number of building permits has remained steady. But this part of the West Loop isn’t all shiny new offices and high-end restaurants. The area is eclectic and gritty. Remnants of the old meatpacking district are still on full display. 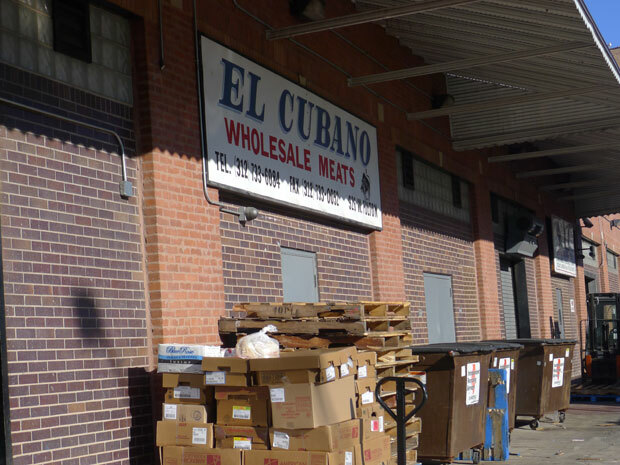 There’s the rumble of trucks, the scent of animal carcasses, and on a chilly afternoon, workers washing a sidewalk in front of El Cubano Wholesale Meats. Rolando Casimiro is one of the owners. He said he’s not fazed by all the new development. “We’ve always embraced the new businesses, the new restaurants, the new nightclubs. We’ve had our issues, we’ve resolved them as neighbors. We have a great relationship standing with them. The issues that arise, we deal with them as neighbors. We don’t need the government to come in,” he said. Businesses want uneven sidewalks fixed and more stoplights, but less city interference in landmarking historic buildings. Now that the area’s a hip destination, they worry landmark restrictions could ultimately hurt their property’s resale value. Roger Romanelli says he hears that concern a lot. But overall, he thinks “uber-gentrification” is working out just fine here. “People are evolving together. People are working together. There’s no winners and losers. There are winners and winners and more winners and we’re all working it out together — residents, businesses and property owners,” Romanelli said. But UIC’s Janet Smith said there are losers when it comes to who rents. “If people think the next best thing is I can rent this out to a high-end gallery rather than to a low-end gallery, they’re going to go with the high-end gallery. Well, the low-end gallery is showing the up-and-coming artist, not the established,” Smith said. As the business boom continues, a sort of exclusivity sets in — for better or worse. “We have to think about what are we doing five years from now that we are either going to regret or we missed an opportunity to keep that diversity that everyone wants,” she said. Back when Fulton and Randolph were sleepy, industrial strips, the homeless and unemployed in the area used to hustle for warehouse work. People like Clifford Smiley, who Romanelli and I encountered on the street during our interview. “They moving a lot of homeless people out of here and we don’t have no place to go, and place to get honest money. These restaurants are coming along but what about us? I’ll wash a window for a dollar,” Smiley said. Romanelli then turned to Smiley and discussed an employment training program. After talking for a moment, Smiley quietly asked Romanelli if he’d buy him a sandwich. Romanelli said he could get him something to eat at the nearby Starbucks.